Last year Verizon began testing sales of its prepaid service through exclusive dealers. 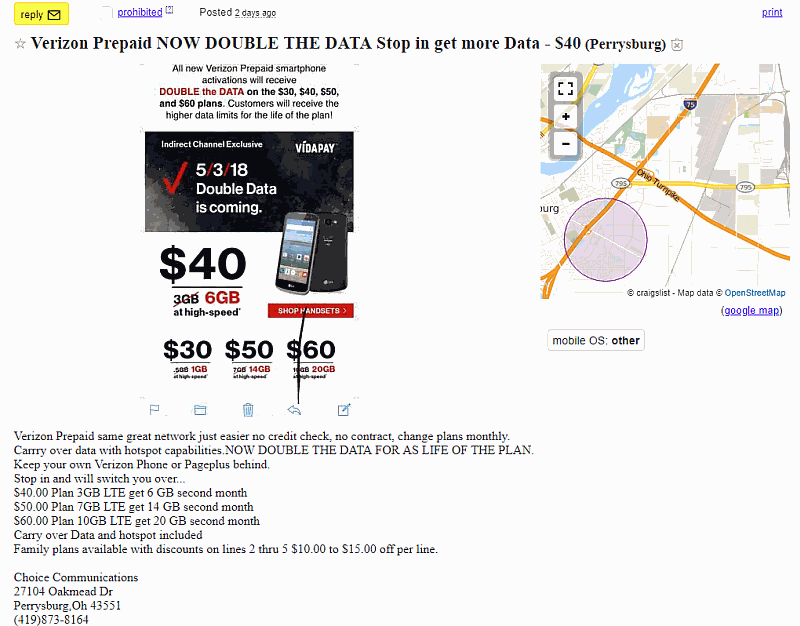 Today, some of those dealers are now offering double the data for life on all Verizon Prepaid plans that have high speed data limits. Dealers using the Vidapay platform have the special pricing. All plans include unlimited talk, text and data with the specified amount of data at 4G LTE data speeds. $60/month - 20GB of data, normally includes 10GB. Also includes unlimited talk and text to Mexico and Canada. All of Verizon's Prepaid plans also include unlimited international texting to over 200 countries, mobile hotspot, and data carryover. Data only carries over for one billing cycle, and subscribers must make on time payments or have autopay billing enabled on their accounts to get it. Video streaming is limited to a resolution of 480p, and during times of heavy network traffic, data speeds will be slower than Verizon's postpaid customers. In addition to the exclusive double the data promotion, select phones are also being offered with discount pricing. The LG Optimus Zone 3 is free after a $35 rebate. It is being sold for $69.99 directly through Verizon Prepaid's website although it is currently out of stock. Independent dealers have the iPhone 6 available for $170 after a $15 rebate. Direct through Verizon the phone costs $199. The double data promotion is said to be for a limited time. No end date has been given. Subscribers will get double the data for life as long as they don't ever port out or deactivate their line. Another place to check would be Craigslist. I found a dealer in Ohio from Choice Communications advertising the deal on Craigslist as well as one in Harrisinburg, VA called Gadget Town, and another Lend Me An Ear Cellular from Eastern Idaho. It has also been confirmed that a dealer in Syracuse, NY called K&B Wireless has it. Is the a list of Vidapay merchants? Unfortunately I don’t have one. You can do a Google search for Verizon prepaid dealers and a lot of sites will come up. You can see if any in your area have this offer available to you. I’ve called several in NC and SC area and none know who Vidapay is? Called Vidapay and they said I could sign up through there website, but it started asking me questions that were for dealers. They “couldn’t” ie wouldn’t, give me a list of there dealers in my area.